How to paint kitchen units. In this DIY how to guide you will learn all about how to paint kitchen cupboards and kitchen units, also including painting timber kitchen worktops. You will find out what types of kitchen worktop you can paint, how to prepare your worktop before painting, how to clean your worktop and how to prime it, apply undercoat and then apply the top coat. 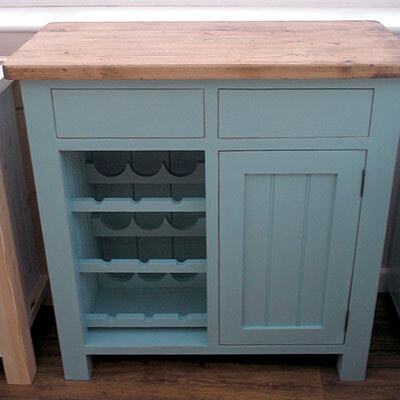 In terms of your units and cupboards you will find out what types of paint are best to use, how to prepare units and cupboards before painting and finally how to prime, undercoat and then top coat them in such a way that you will get a beautiful smooth finish. Numerous questions we have received often revolve around painting kitchen units or cupboards, painting or varnishing worktops and generally revamping an existing kitchen. This is a very popular DIY job mainly due to the cost of moving into a new home and the resulting limited funds available in order to put your own stamp on the interior décor, as, after all, you want it to feel like your home and not still the previous owners. Revamping kitchen units and cupboards can be done with relatively little outlay but can totally transform a kitchen area, especially if you have a little spare cash for new worktops and unit doors. Can I paint any Type of Worktop? As far as worktops go, unless they are timber, such as a hardwood worktop, they should not be treated or painted with anything or in any way as in pretty much all cases the varnish or paint will not penetrate or bond with the surface. As you can imagine, the laminate coating on a traditional worktop is designed to keep water, moisture and food stuff etc…. from penetrating the wooden core and thus will prevent varnish and stain from soaking in and also paint from keying to the surface. The paint, varnish or other covering or treatment will eventually (quite soon in most cases) chip and crack. Worktops are used continually even if it is only to dump things on and they will mark! These imperfections will then harbour germs leading to a very unhygienic work surface. Timber worktops should be treated with oil and this procedure can be seen in our project about the treatment of wooden worktops. 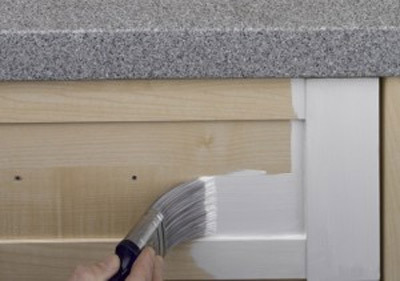 As mentioned above, you should only try and paint a timber or wooden worktop. In many cases the worktop will have been treated with an oil, varnish or stain at some point and depending on the length of time that it has been on the surface will depend on the finish and success of the job as a whole. The nature of a stain or oil is that it soaks into the wood and prevents things from soaking in, in this case the paint. If the paint can’t soak into the surface and create the necessary bond to hold it there then it will eventually crack and flake off. If it is possible to find out if the worktop has previously been treated and what with, this information will be very useful. If it has been treated with Danish oil then, depending on the manufacturer, it should be possible to prime and paint as most oils of this type can be painted over. However, if the stain or oil is non-porous and has been on the surface for a considerable amount of time then it may be possible to get a positive outcome. When it comes to the type of paint to use the best choice is a semi or part gloss as this will minimise any visible brush or roller marks. 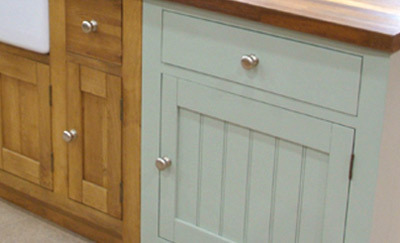 Flatter, more matt finishes will also give a resistance when wiping over as it will produce a chalk-like finish. NOTE: If it is at all possible, it’s a lot easier to get a good finish on your worktop if you move to a garage or other area rather than try and work on it in the kitchen. Once completed it is a good idea to leave the worktop for at least 24 hours for it to harden off, preferably you should leave for at least 48. The traditional coating for kitchen cupboard doors is gloss. 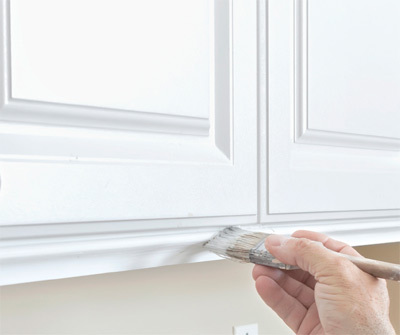 This is fine to use and will give a very nice finish but is does have one drawback in that it is not very forgiving on any imperfections in the doors themselves and will also show up any brush strokes created during the painting process. In light of this, an eggshell finish is a good way to go. This will provide a very good finish and will also be quite forgiving when it comes to brush and roller marks. When it comes to the type of paint e.g. water based, oil based etc…. check with the manufacturers guidelines on the packaging in terms of what surfaces the paint can be used on to ensure its suitable to use on your kitchen units, cupboards and doors. Paint Cupboards or Units in Situ or Remove Them? When it comes to where you carry out the work to, the best solution is to remove all the items e.g. units and cupboards and prep and paint them in a garage or other space. This will give the advantage that you will have plenty of space to work in and avoid having to paint around worktops, walls and appliances. You can paint the entire object in one go. This should certainly be possible for any unit or cupboard doors as these can be easily removed by undoing the hinges but this might not be possible for floor units as they may be screwed to walls, appliances, have worktops on top of them and generally be a pain to remove, especially if you have a family and need a functioning kitchen, so you may need to work on them where they are. If you do have to paint each item where it lays then make sure you use masking tape to mask off any area that you need to avoid getting paint on. Your masking up should be done just before you start painting, after you have completed all the cleaning and preparation work. Another solution, if you don’t want to gut your entire kitchen in one go, is to remove and paint one unit or cupboard at a time. 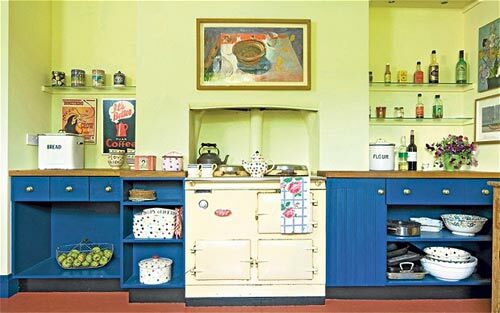 This way you can still maintain a working kitchen, albeit missing a base unit or cupboard. Whichever route you go down, ensure that you remove all handles and hinges before you start. Keep them in a safe place such as a container or bag so you don’t lose any screws etc…. The act of cooking and preparing food often releases grease and moisture into the air and this can settle on all your units even if it is invisible to sight and touch. Laminate Surfaces: If the surfaces you are painting are laminated or coated then you will not need to rub them down, you can just apply a melamine primer (see below). You will still need to clean them thoroughly though! In the final part of the decorating process we get to the actual painting stage. There are several different levels of painting that will need to be completed in order to get a good finish. In all cases it’s also a good idea to use a decent paint brush with fine bristles as this will help to reduce the number of visible brush marks. The way in which you apply the primer, undercoat or top coat can also have an effect on the finish. Where possible, try to apply each coat in the same direction e.g. either up and down or side to side. In respect to the number of coats, one should be enough if existing colours are quite light but if they are quite dark or glossy then it may be best to go with two just to be sure you don’t get any bleed through from the darker colour. Give the first coat a quick rub over with sandpaper to flatten it back. Thoroughly remove and dust before the second coat. Once you have primed the surface correctly you should then be able to use any undercoat on top of the primer, as long as the manufacturer has stated this (check manufacturer’s directions on the tin). In most cases, one coat should be enough but if you find that you have quite a few brush strokes showing then apply a second. If you need to apply a second then give the first coat a light rub over with some sandpaper beforehand. Make sure you wipe off any dust before applying the second coat! In respect to what colour undercoat to use, try to choose one that is a close match to your topcoat as this will help with the final finish. Once the undercoat has dried thoroughly it’s time for the top coat. As before, give the undercoat a very light sand over to flatten it back and then remove any traces of dust. You will need to apply a minimum of two topcoats to get a decent finish, again allow each to dry and then give it a light sand over to flatten it back before the next coat. Don’t overload the brush with paint and only apply in thin layers as you don’t want the finish to look clumpy or be full of runs. Now that you have given your cupboards or units a makeover the final finishing touch is to replace the handles and /or hinges. Depending on your choice of colour and style you are going for, you can pretty much guarantee that there will be a range of fittings to suit. Whether you are going for a minimal contemporary look or more of a traditional style, you are sure to find what you are looking for. When searching for new kitchen unit or cupboard furniture, make sure you take a selection of your old fittings with you (if you are going out DIY stores etc….). This way you will be able to see the exact sizes and spacing’s for fittings. Also, take a tape measure with you and note pad with all the measurements of the doors, units or cupboards you are purchasing fittings for. You might not need it but if you do then it’s there!